Following a preface (see f. 172v) and a list of chapters, this initial 'P', presumably depicting Cassiodorus, introduces the start of the main text. The red annotations in the left margin mainly mark passages that refer to other authors: for example, 'Aug.' in the lower left corner refers to Augustine in the immediately adjacent line of text. 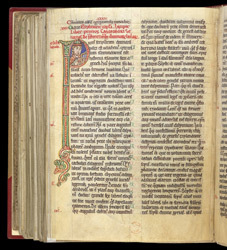 Folios 151-192 of this manuscript were formerly part of Arundel MS 36, which has an ownership inscription of the Augustinian priory of the Holy Trinity, Kirkham (Yorkshire).